In 1977, when Mary-Ann McDougall - mother, wife and teacher - first heard Swami Sivananda Radha speak at Yasodhara Ashram, she knew she had found what was missing in her life. 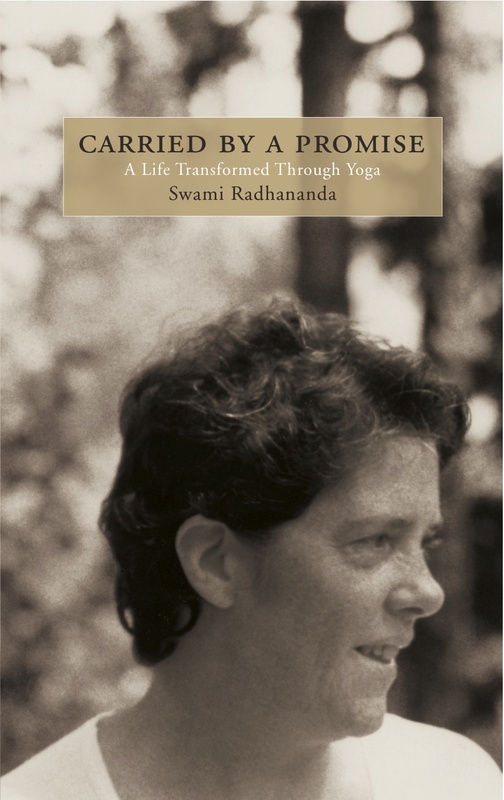 Her memoir, Carried by a Promise, is the unique story of a woman's spiritual journey that follows her deepening commitment to Swami Radha and the extraordinary events that lead to her transformation into Swami Radhananda. Carried by a Promise offers a very human example of how a heartfelt promise to the divine can carry us on the spiritual path. Above all, it gives an intimate look into the love between a guru and a disciple is a sacred connection that has the power to transform. "She and I have made a promise. She gave me a thread that connects us forever. I have seen the looks of love that shine from her eyes in blessings. Sometimes her voice comes through me clearly. She is my spiritual mother who has imbued each cell with Light, who is the flame in my heart." "Ultimately this is a story of dedicated love and surrender to the Divine Light. Swami Radhananda's absolute devotion to Swami Radha shines throughout the pages and is an inspiration for us all." buy it for the Kindle!